Sanchez begins his first season on Long Island and 13th in professional baseball. The catcher brings seven seasons of Major League experience to the Ducks, having spent time with the San Francisco Giants (2011-15), Chicago White Sox (2016) and San Diego Padres (2016-17). In 347 MLB games, he accrued a .238 batting average with 21 home runs, 120 RBIs, 60 runs, 186 hits and 38 doubles. Defensively, he turned in a .988 fielding percentage at catcher and threw out 25% of base runners attempting to steal. The 29-year-old’s career was highlighted by helping the Giants win the 2012 World Series in a four-game sweep over the Detroit Tigers. The Venezuela native hit his first big league homer on April 23, 2012, at Citi Field off New York Mets pitcher Dillon Gee. Two seasons later, he was the catcher for Giants pitcher Tim Lincecum’s second career no-hitter. 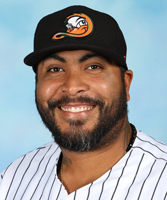 Sanchez returned to the Giants organization in 2018 when he played with Triple-A Sacramento. In 24 games, he hit .241 with a homer, eight RBIs, 10 runs and four doubles. He then took part in spring training this year with the Detroit Tigers, appearing in 11 big league exhibition games. Sanchez was originally signed by the Giants as an amateur free agent in 2006.